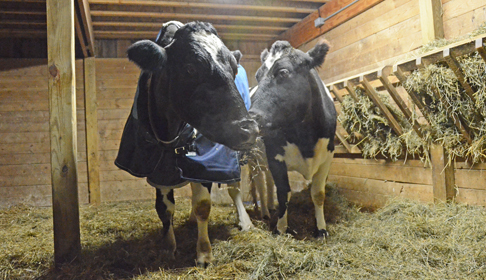 Thanks to Sue Manning at the Associated Press, we learned this week of an amazing story of two blind cows, Sweety and Tricia. Sweety was rescued from a slaughterhouse in Canada by Refuge RR, a horse sanctuary in Ontario, and needed a new home. So Refuge staff put the word out. 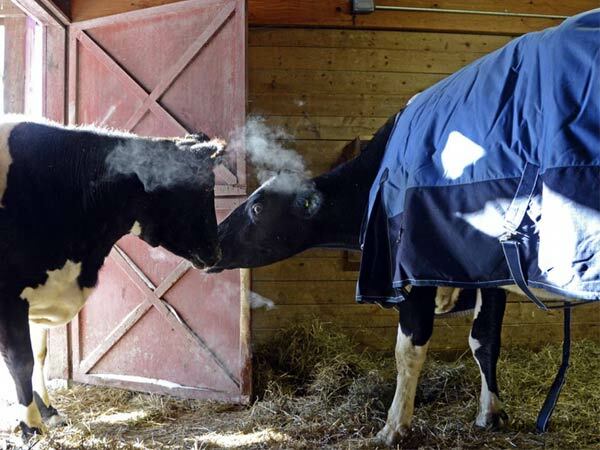 Farm Sanctuary in New York currently cares for a blind cow, Tricia, who was also rescued from a slaughterhouse. Tricia lost her companion last year, and has been sad ever since. So the folks at the two rescues decided they needed to be together. But it wasn’t so easy. There was lots of paperwork to be done to bring Sweety across the border. It took almost a month! Eventually the big day arrived, and Sweety came to her new home and met her new friend. This is Farm Sanctuary’s video from YouTube. WARNING: Have a tissue handy. « Do We Enable Hoarders? Thanks! I loved this story. It doesn’t take much to get the tear ducts started these days Rumpy and out came the tissues for sure.. What a wonderful story and heartfelt video… Thank goodness there are people out there like your good selves who do this wonderful rescue work…. Thank goodness for good PR folks at Farm Sanctuary! woo woo woo! Me too Kevin! There is much good in the world too! I’m glad it made you happy like it did me! Oh what a glorious “happy ever after” for those two girls…..my heart is so happy. Such a sweet story! Thanks for sharing. Thanks! I was bowled over by this one. That’s the best video I’ve seen all week! Those girls are like the cow version of Lady and the Tramp, but with hay instead of spaghetti! So sweet! Nice job, R.
Glad you liked that story as much as I do, Cupcake. So beautiful. Thank you to the folks at Farm Sanctuary! It always amazing me that animals just know what to do for each other. Yeah, well, humans are the LEAST compassionate species on the planet. This was wonderful! Thanks Rumpy! You’re very welcome Katie Isabella! Yow Rumpy we got leeky eyez here watchin Sweety n Tricia meetin n beecomin furendz!!! What a touchin story!! 2 pawz up fer all da Hu’Manz involved who brott deze 2 together n carin fer dem…PAWTASTICK!!! That story sure made my day too!!! OMG I can’t stop crying. I am giving to Farm Sanctuary right after I hit “Post Comment!” So glad that they were rescued. I’m never eating beef again, and will wean myself off of all dairy products as of this day! Thank you, Rumpy, for humanizing these wonderful animals. I saw a man on Good Morning America who is making meat substitutes from all-plants sources. He said that growing up on a farm, he couldn’t understand the difference between cows and dogs. Why it was okay to eat one, but not the other. Now I truly understand. God bless you! When the student is ready, the teacher appears. Glad I got to be a part of that lesson for you! What a beautiful story – thank you for sharing. Animals are so innocent. Bless everyone who helped them. We love heart warming stories. I’m glad these girls have a safe and comfortable place to call home now. A beautiful story. So sweet! Love love love this story!!!!!! That’s lovely. I think they’re going to be the best of friends. I love happy endings or I should say, happy beginnings! Finding a new friend and a safe home … priceless. I do love upbeat stories. It gives me hope for others that need rescuing. Thank you for sharing.